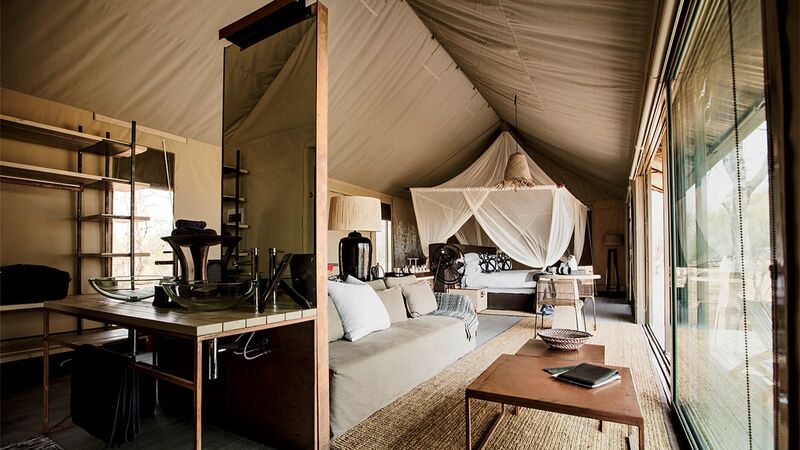 Understated luxury at the new Linkwasha Camp, in Hwange National Park. Is Zimbabwe the Next Hot Safari Destination? 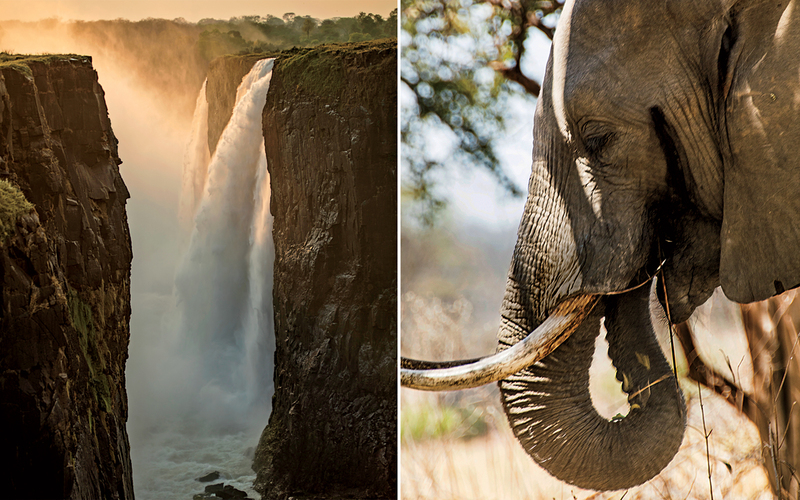 After decades of political instability, Zimbabwe is poised for a comeback, with luxurious new lodges, some of the continent's best guides, and—despite the poachers and hunters—a glorious profusion of big game. As dawn broke over the Ngamo Plain in Zimbabwe’s Hwange National Park, we set out in search of a male lion that local game guides call Bhubezi. At the wheel of our clapped-out Toyota Land Cruiser was Brent Stapelkamp, a dashing young researcher who has been studying Hwange’s prides for almost a decade. The thick Kalahari sand was a test for our wheezing vehicle, but the greater challenge was tracking down Bhubezi, an eight-year-old lion who, together with his brother Bush, has dominated part of this 5,400-square-mile park on Zimbabwe’s western border for the past four years. Our search for Bhubezi was urgent, Stapelkamp explained, because just two weeks earlier Bush had been killed—shot by an American hunter on Forestry Commission land a mile outside the park. Though bait was laid to lure the animal into the hunting zone, his death was perfectly legal. Under the Forestry Commission’s quota, two male lions can be killed on land adjacent to Hwange each year. In theory, the system is tightly controlled. Annual quotas are issued to landowners and operators, and the professional hunters who accompany guests are subject to strict licensing. Hunting is big business: Bush’s killer probably paid between $10,000 and $20,000 for the privilege of shooting him and taking his head home to mount on the wall. In 2013, hunters exported 49 lion trophies from Zimbabwe; more than 250 lions are legally killed in South Africa every year. But conservationists argue that, with large sums of money at stake, corruption has undermined the quota system across Africa, where large expanses of bushveld make individual hunts hard to monitor. Just a few weeks after my visit, another hunt 20 miles away killed Cecil, a 13-year-old black-maned lion, and the event caused a storm of outrage on social and news media around the world. Like Bush, Cecil was one of 30 collared animals in Hwange being tracked via GPS by Stapelkamp and his fellow researchers at Oxford University’s Wildlife Conservation Research Unit. Like Bush, Cecil had been lured out of the national park and onto a private concession. There, while feeding on an elephant carcass, he was shot with a bow and arrow by Walter Palmer, a dentist from Minnesota. Stapelkamp pointed out that, unlike in Bush’s case, neither the landowner nor the professional who led the hunt had the correct permissions. “Cecil’s hunt was illegal. It was poaching, pure and simple,” he said. Although the Zimbabwe government asked for Palmer to be extradited, it now looks as if all charges related to the case will be dropped. According to Stapelkamp, both deaths will cause massive upheaval in the surrounding lion territories. Bush and Bhubezi’s pride had numbered 20; with one of the males dead, the other will now be under threat from encroaching rivals, who could kill the brothers’ cubs and mate with the females to create a new pride. “One man goes home with his trophy and the pride falls to pieces,” Stapelkamp said. As we spoke, Bhubezi’s plangent calls for his brother rang out across the plain—an ominous sound for the pride, as it offered an unintended invitation for marauding bachelors to attack. This is a critical time for African wildlife conservation. Poaching continues to blight the continent, habitat encroachment threatens big cats and other significant species, and efforts to protect endangered animals face a complex and precarious future. In Zimbabwe, where the most recent decade of President Robert Mugabe’s autocratic rule has brought the country to the brink of economic collapse, natural assets with commercial value— such as wild animals—are particularly vulnerable. And there is almost no state funding for conservation projects, so parks rely heavily on tourism revenue to maintain some semblance of order. The good news is that the numbers of both foreign visitors and some wild animal species are on the rise. (Certain experts argue that the increase in wildlife is, in part, due to licensed hunting, as the practice has dramatically increased the amount of land under wildlife management.) High-end safari camps are opening, major infrastructure projects are in progress, and the animals these operations serve to protect will likely only continue to flourish. As a result, a country that has always been an extraordinary place to visit now offers a wildlife safari experience to rival any other on the continent. We drove back to our camp as dusk was falling and arrived in time to sit around the campfire, watch the sun set, and allow the events of the day to sink in. We were staying at Linkwasha Camp, a new $2 million property in Hwange built by Wilderness Safaris. In a country still some way from political stability, the project represents a significant investment. Wilderness CEO and Zimbabwe native Keith Vincent joined us around the fire, and was brimming with optimism about his country’s potential. He described the new Victoria Falls Airport, 125 miles from Hwange and slated to open later this year, as “a game-changer for safari tourism in the region.” He seemed confident that, with the expected upswing in international flights, Zimbabwe would see a significant increase in precious foreign revenue. Vincent pointed out that Botswana, where Wilderness built its first safari camps, “is pretty much full, and the troubled times are all but over in Zimbabwe. People have come to understand that it is not an unsafe destination.” His optimism is typical of Zimbabweans—always positive, making a plan, moving onward and upward. Victoria Falls, in northwestern Zimbabwe; An elephant feeds on foliage at Ivory Lodge, in Hwange National Park. It surprises many Westerners to learn that not only is Zimbabwe very safe, but that its people are utterly charming. I have always maintained they are the nicest in Africa, but then I am somewhat biased: I grew up here. Strange as it may sound, even during the dark days of the Rhodesian war in the 1970s, I witnessed little personal animosity between ordinary black and white people. And though, in recent years especially, Robert Mugabe has spewed anti-West, anti-white rhetoric (his campaign, in 2000, to seize white-owned commercial farms triggered the collapse of the industrial sector and brought the country to the brink of famine), among his beleaguered citizens there is very little evidence of race hatred. Out in Hwange’s pristine wilderness, the Sturm und Drang of African politics is a distant thunder. Instead, there are thriving populations of wild animals—which, on this continent of ever-shrinking habitats, is reason for cautious optimism. On this trip I witnessed massive herds of elephants and buffalo and a variety of antelope—sable, eland, kudu—whose proliferation has led to flourishing predator populations in parks across the country. Twenty years ago, the wildlife concessions surrounding Linkwasha Camp were home to just 16 lions; today, about 100 live in and around the concession. Other major predators—leopard, cheetah, and hyena—are also there in healthy numbers. There are an estimated 30,000 elephants in the park, and if you include the animals in contiguous parks in Botswana—Okavango, Linyanti, and Chobe—that adds up to more than 230,000 elephants in the region, easily Africa’s most significant pachyderm population. There are other positive signs for safari tourism in Zimbabwe. The wildlife guides who, during the worst years of the country’s economic collapse, left to ply their trade in nearby Tanzania and Kenya, have started coming home. It is widely acknowledged that this country’s guides are the best on the continent, not only because Zimbabweans are a charismatic people but also because the guide-training system here is the most rigorous and comprehensive by some distance. I was lucky on this trip: one of those returning guides, Lewis Mangaba, now leads guests at Linkwasha—a significant coup for the camp, as he is regarded as one of the country’s finest. Hwange was just the first stop on a monthlong trek through Zimbabwe that took me next to the Zambezi Valley, then to the country’s capital, Harare, on to its second city, Bulawayo, where I grew up, then finally to Victoria Falls, the epicenter of Zimbabwean tourism. It was a journey through the past and the present, from early colonial history and the days when Cecil Rhodes and his fellow British settlers created Rhodesia, through the last days of the colony—the backdrop of my own boyhood in the late 1960s and 70s—and finally to the economic poverty and political uncertainty of modern-day Zimbabwe. After three days in southeastern Hwange, I boarded a two-hour flight to Ruckomechi Camp on the Zambezi River. Ruckomechi is one of my favorite places in Zimbabwe, partly because the 10-tent property has retained a rustic feel, but mainly because of its sublime location in the Mana Pools National Park, on the southern bank of the Zambezi. Shaded by acacia and mahogany trees, Ruckomechi has an uninterrupted view of the mighty river and the Zambian escarpment beyond it. The only sounds are provided by hippos grunting in the shallow waters and the occasional rustle of an elephant passing through the camp. Guests, on the other hand, are extremely cautious around the elephants here, for although most are unthreatening, the occasional young bull in musth (a periodic hormonal change) can go mad enough to menace a fragile Homo sapiens in its path. Kazingizi’s statement was a reminder of how poaching can not only drive signature species to extinction but also destabilize entire ecosystems. This area of the Zambezi Valley was once home to more than 2,000 black rhinos, but a wave of poaching in the 1980s wiped out the entire population in a matter of years. These cruel dramas are being played out across Africa, and seeing these small imbalances of nature close-up brought home the far-reaching impact they can have. 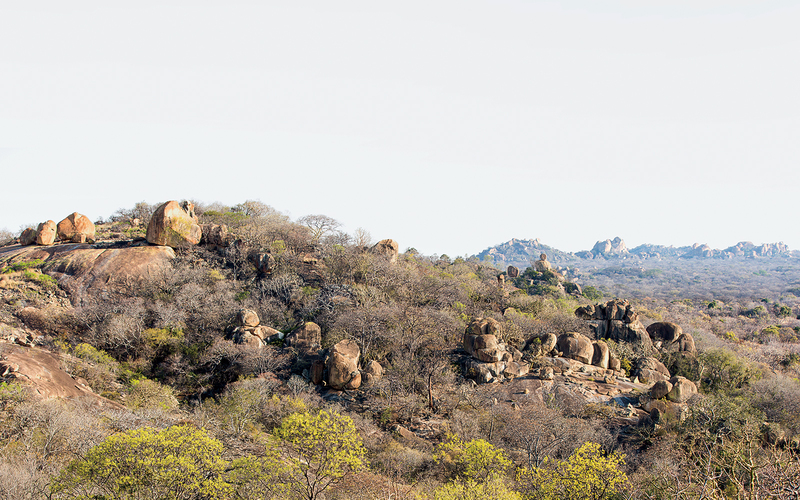 The Matopo Hills, near Bulawayo, hold special significance for Zimbabweans. The rest of our walk, however, was sheer pleasure. Although you don’t see as many animals up close on foot as you do in a vehicle, walking connects you to the African landscape in the most profound way. We took a wide arc around an elephant breeding herd, for although they were browsing peacefully, female elephants with young calves can quickly become agitated. Kazingizi, with his .458 rifle at the ready, stalked ahead of me and, after hearing a sudden cacophony of alarm calls from baboons, blacksmith plovers, and go-away birds, decided we should walk closer to the river— clearly there were lions somewhere in the long grass. Right on cue, a long, throaty roar emanated from beyond the mopani trees. Kazingizi urged caution: there was a hunting concession not far away, so there was a chance the animal could have been injured. After an exhilarating morning in the bush, I returned to camp, had a late breakfast at a table overlooking the Zambezi, and took a final wander around Ruckomechi. As always, there were elephants everywhere, chewing on foliage, oblivious to the guests tiptoeing behind them. After a week in the Zimbabwe bush, experiences like this had truly recharged me, and restored my love affair with Africa. Now it was time to head to the airstrip and confront urban life. In complete contrast to the serenity and timeless order of life in the bush, Zimbabwe’s principal cities, Harare and Bulawayo, display all too vividly the alarming decline of the country’s fortunes under Mugabe. Roads are rutted and potholed; streetlights and traffic lights are frequently out of order. The pavements of the inner cities—in Harare, in particular—are crammed with vendors hawking fruit, clothing, mobile airtime…anything. There are police roadblocks everywhere, fining drivers all day long, often on preposterous pretexts. In Harare, at least, there was a veneer of affluence provided by the embassy crowd, the NGOs, and aid executives, all zooming around in their shiny 4 x 4s. But ever-present under this surface wealth was torpor and unemployment, a reflection of the fact that the country’s industrial and agricultural output continues to falter. The once thriving wheat fields outside Harare appeared to have turned to bushveld, and Bulawayo, formerly the country’s industrial engine room, looked decidedly down-at-the-heels. One crystal-clear autumn afternoon, Hubbard and I went out to the Matopo Hills. This uniquely beautiful place is sacred to the Ndebele people, a branch of South Africa’s Zulu tribe that fled the tyrannical reign of King Shaka in the 19th century and settled in Bulawayo some 20 years before the colonialists arrived. It is also of special importance to white settlers: their forefather, Cecil Rhodes, is buried here. Known as Matopos by the whites and Malindidzimu, or “Place of the Spirits,” by the Ndebele, it has a dramatic sense of a history shared by black and white Africans. From one of the highest viewpoints, the place Rhodes called the View of the World, we took in the grassy plain, the outcrops of acacia and paperbark trees, the granite rocks piled one on top of another in impossible geometric formations. As a young boy growing up in Rhodesia more than a halfcentury ago, I used to come here and consider the future with all the enthusiasm and innocence of youth. Just as in my boyhood memories, the landscape was completely still, bathed in the golden light of evening. I looked down on a scene unchanged since modern man placed his heavy footprint on the planet, and remembered all that had come and gone. Most major airlines fly into Johannesburg, South Africa. From there, travelers can connect either to Harare or to Victoria Falls. U.S. citizens can obtain a single-entry visa valid for 30 days for $30 on arrival at the airport. Although the U.S. State Department warns that U.S. citizens traveling to Zimbabwe “should avoid all crowds, public demonstrations, and protests,” the country is safe for visitors, particularly on safari. Expert Africa: Guests on this nine-day safari stay at the Linkwasha Camp, Ruckomechi, and Victoria Falls Safari Club. From $5,457 per person. Amanzi Lodge: A 16-room boutique hotel surrounded by gardens and waterfalls. Harare; doubles from $300. Banff Lodge: Eleven rooms in a historic building in Bulawayo. Doubles from $132. Wilderness Safaris Linkwasha Camp: An airy luxury camp (right)with a pool and tents overlooking a water hole perfect for year-round game viewing. Hwange National Park; from $572 per person. Wilderness Safaris Ruckomechi Camp: Set beside the Zambezi River, this camp includes outdoor showers, a stargazing deck, and an infinity pool. Mana Pools National Park; from $702 per person. Victoria Falls Hotel: An Edwardian structure that served as lodging for workers on the never-completed Cape-to-Cairo Railway is now one of the most luxurious stays in Zimbabwe. Doubles from $395.